I’m inherently lazy. I ignore the pile of clean laundry until it has to be tossed in the dryer again to remove wrinkles caused by sitting in a pile for too long. I never make the bed (unless guests might see it). I make an absolute mess when I cook. I still make silly mistakes, like forgetting key ingredients at the store or mixing up baking soda for baking powder. But I do feel like I’ve earned a place in the kitchen when I bravely attempt a new dish that I think is going to be tricky, or dive in without a recipe… and knock it out of the park. That’s how it went with the Sausage and Spinach Calzones I tackled the other night. I’d never made calzones before, but I had leftover Italian sausage and some pizza dough to use. It had to be kind of like a pizza, right? I trusted my instincts and just started to cook. 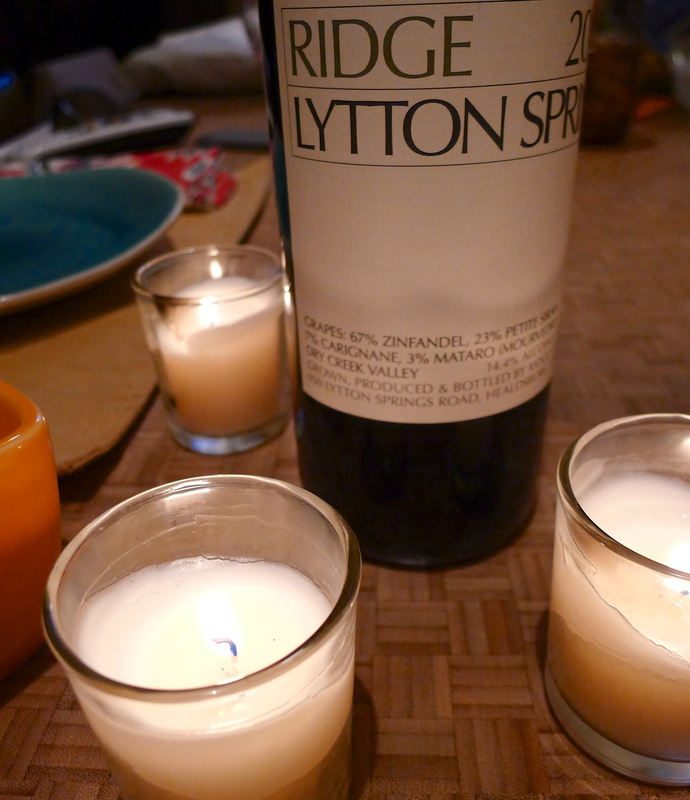 Here’s how it came together. 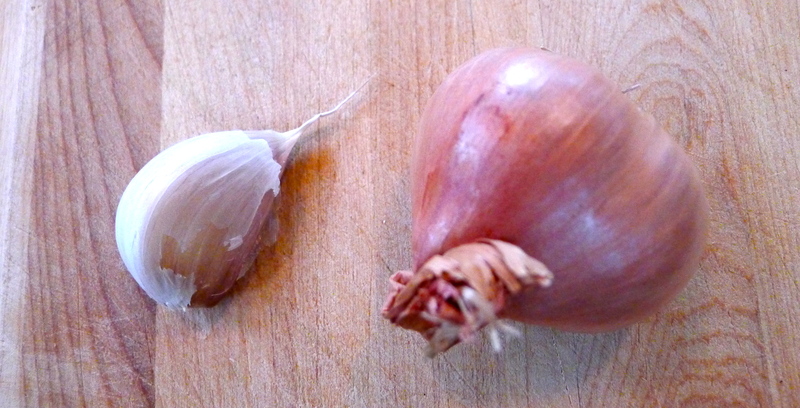 First, I chopped and sautéed a little garlic and a shallot. (I forgot to buy an onion…sigh.) 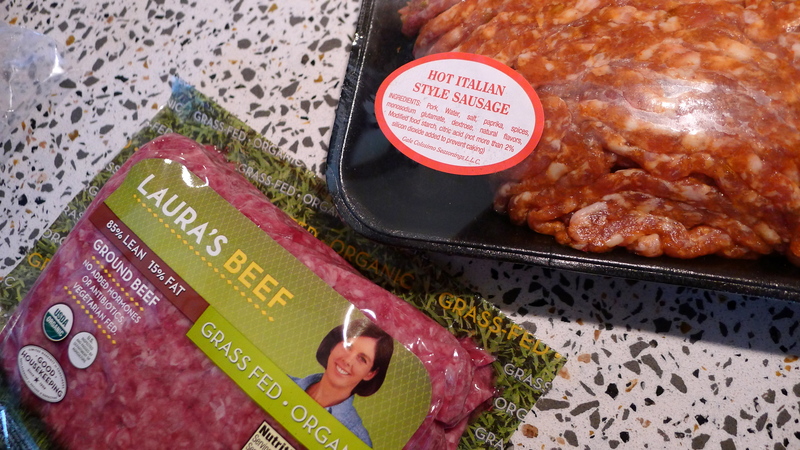 Then, I browned the sausage with some ground beef and added a lot of seasonings that sounded calzone-y. 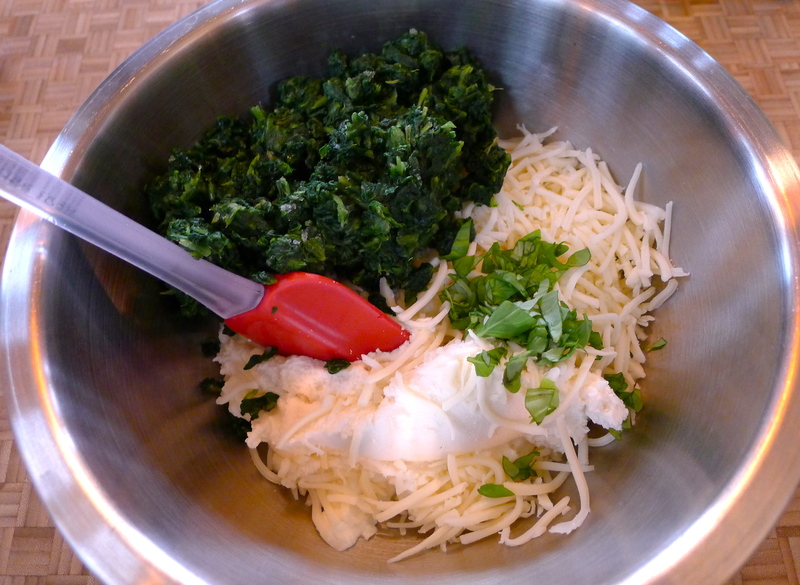 Next, I mimicked lasagna and mixed up a bowl of ricotta, mozzarella, frozen spinach, fresh basil, and more seasonings. Let’s make calzones! 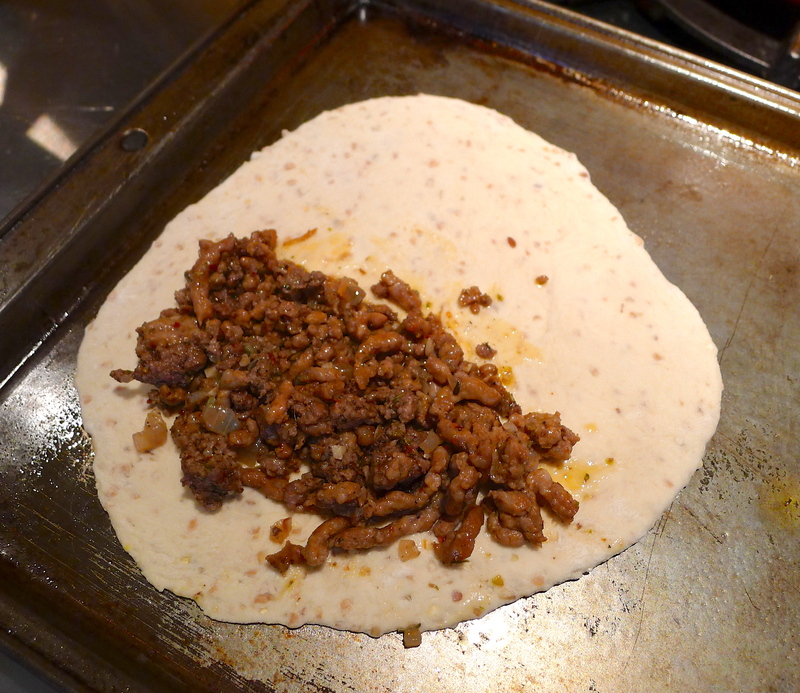 I rolled out chunks of dough into discs and, one by one, filled one side with meat and the cheese mixture. 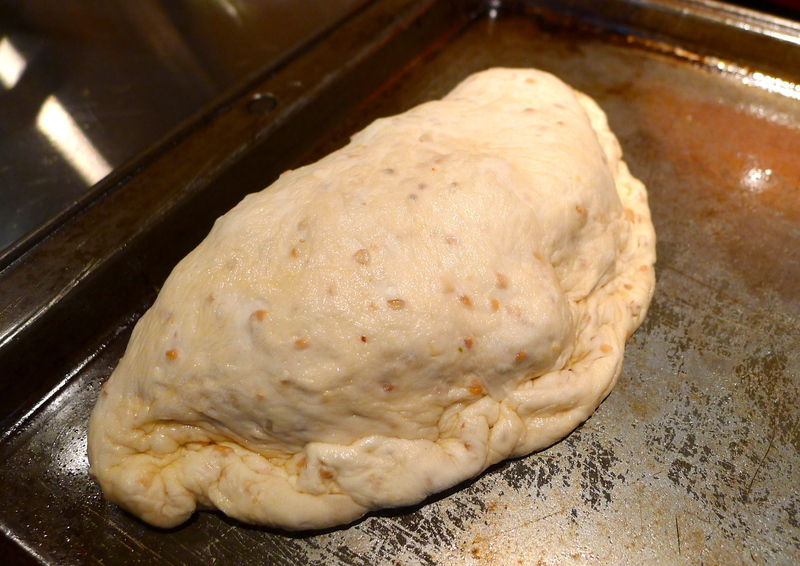 Then I simply folded the dough over, crimped the seam, and brushed garlic-infused olive oil over the top. Look at those chubby things! 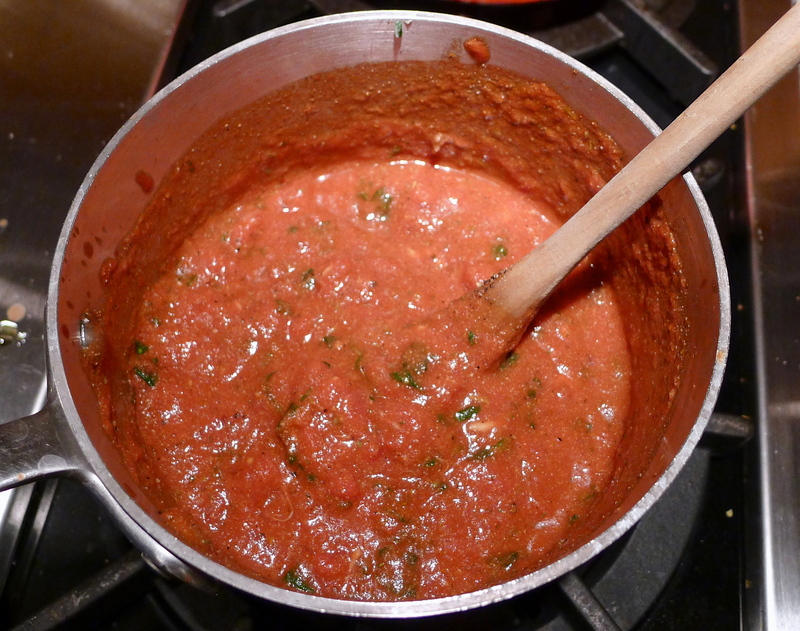 While the calzones baked, I worked on an easy marinara sauce to be served on the side. 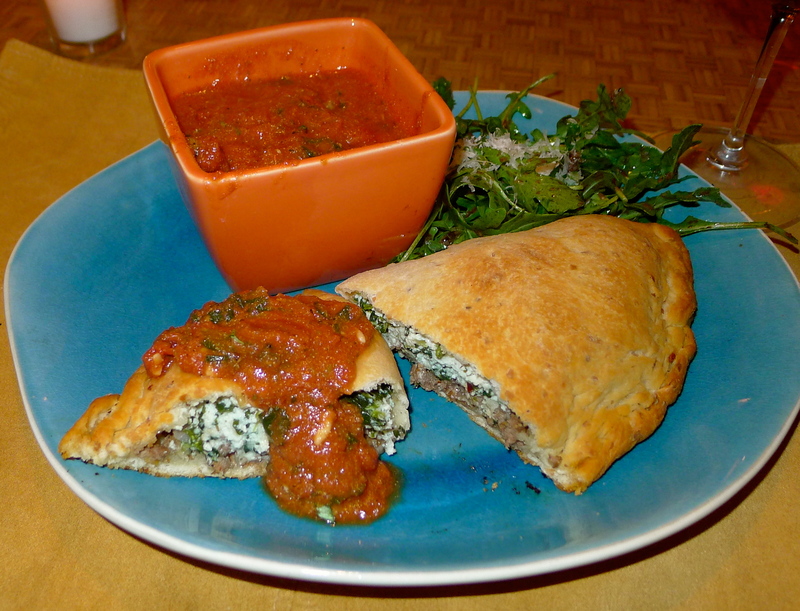 (A Stromboli has the sauce baked inside the dough; a calzone has it served on the side or on top.) Since I’d forgotten the onion (and other crucial ingredients) for a traditional marinara, I used some pizza sauce, a can of crushed tomatoes, fresh basil and garlic, and lots of garlic salt and pepper. To make this easy dinner even easier, you could simply heat up premade pasta sauce! 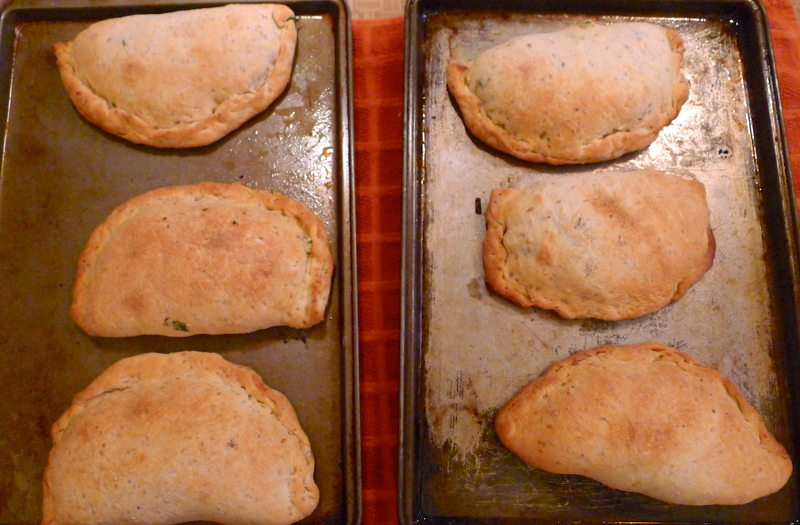 When the calzones were nice and browned, I set them on the counter to cool for a minute or two. Little pockets of love! 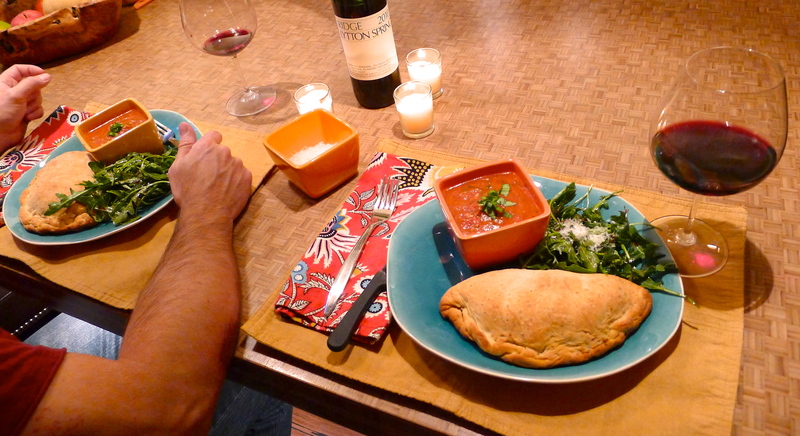 We made a quick arugula salad (which I basically ignored) and cut into our calzones. 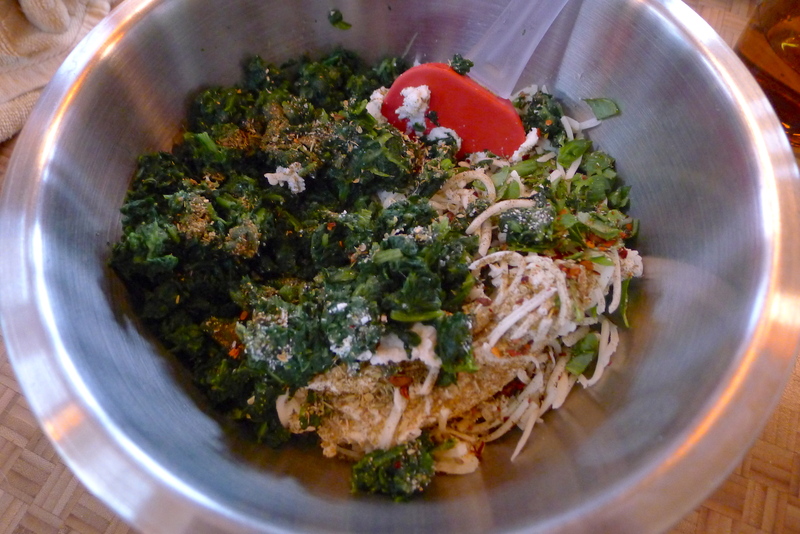 Even before the additional seasonings, the Italian sausage brings so much flavor on its own, and the cheesy spinach mixture was creamy and delicious. 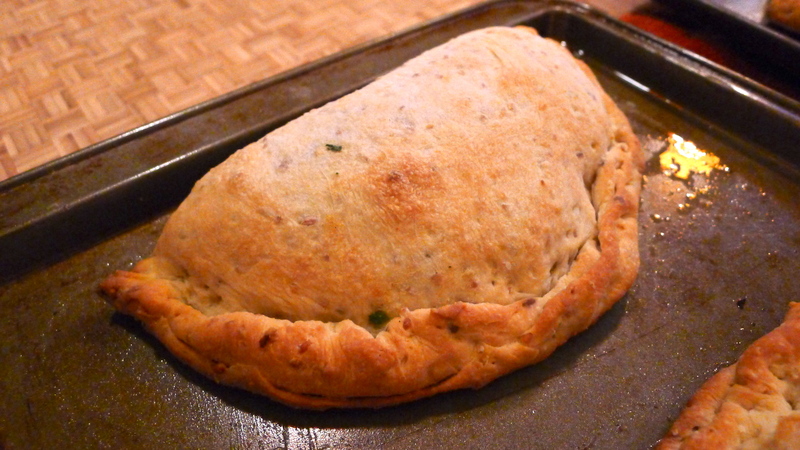 My only complaint was that I didn’t add enough mozzarella – I like the gooey, melty experience of a hot calzone! The fun of calzones, just like with pizza or even lasagna, is that you can use whatever filing you like: sautéed veggies, chicken, different cheeses. I can’t wait to experiment with other flavor combinations! 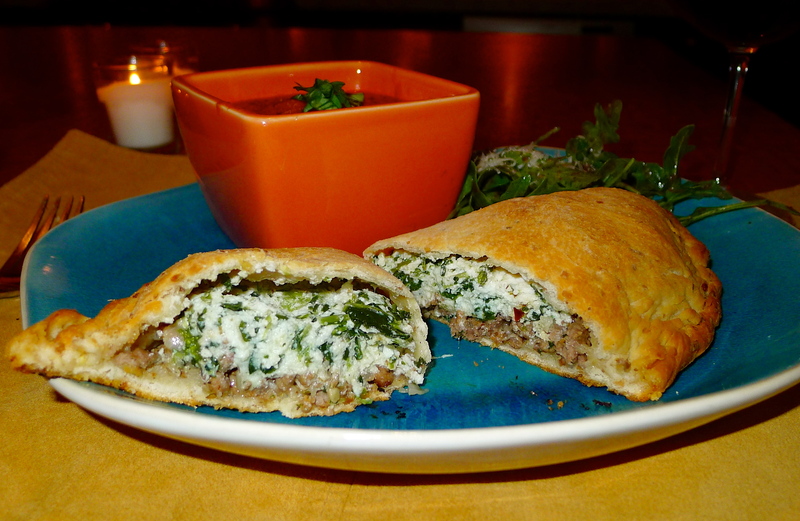 A zucchini-mushroom-spinach calzone would be divine. The best part is that after they cooled completely, we wrapped the leftover calzones in foil and plastic and froze them for future meals. YUM! I may fall sort in a lot of ways around the house, but I came up with a simple, delicious dinner and stocked the freezer in one evening. High five! John called his calzone “unbelievable.” That works for me. Preheat oven to 425 degrees. Spray two baking sheets with cooking spray. 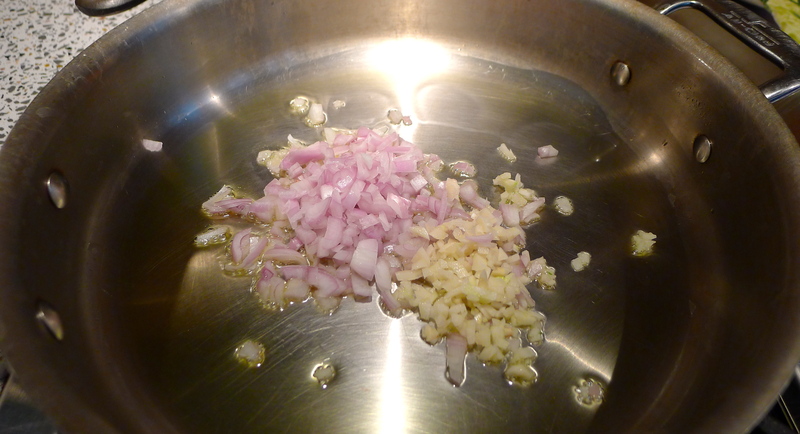 Sauté garlic and shallot in a swirl of olive oil over medium heat. 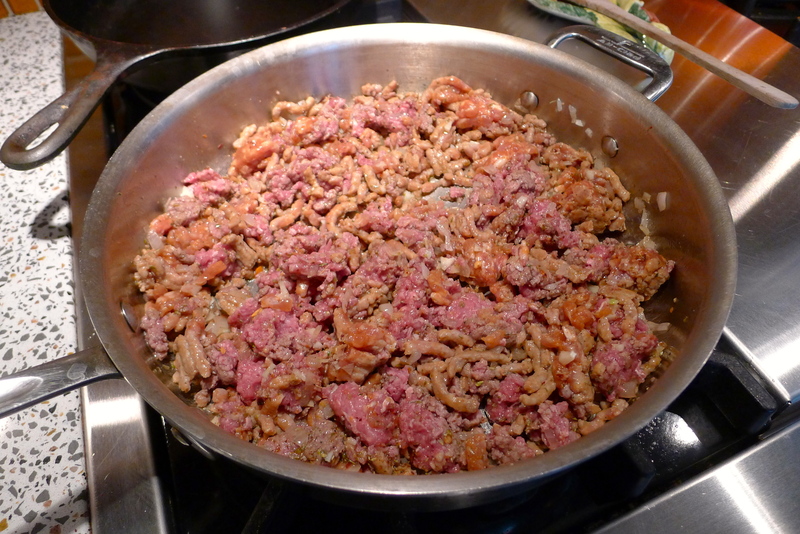 When slightly tender, add the sausage and ground beef. 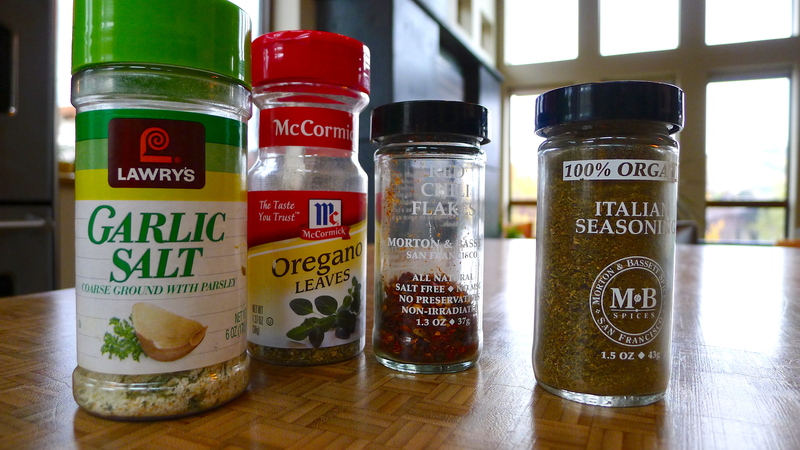 Add 1/4 teaspoon each of garlic salt, oregano, Italian seasonings, and red pepper flakes. 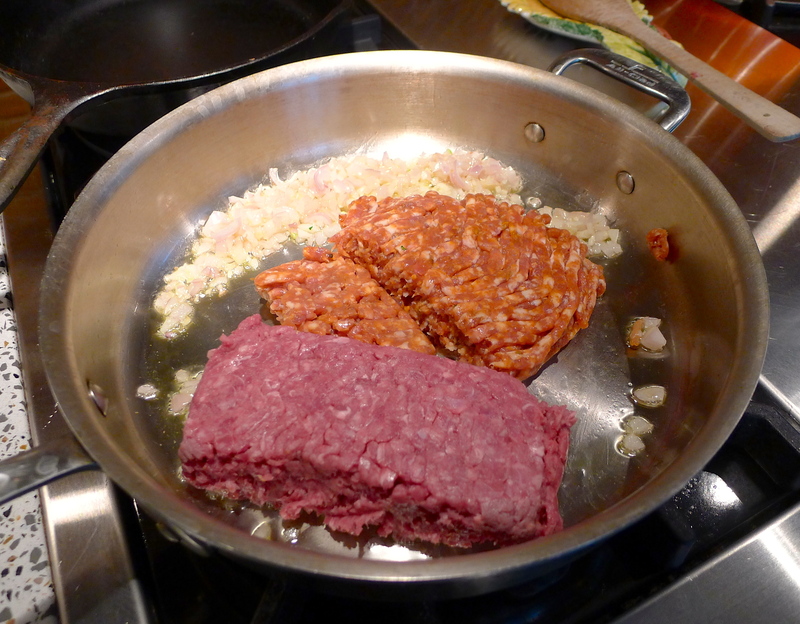 Cook until the meat is browned and turn off the heat. 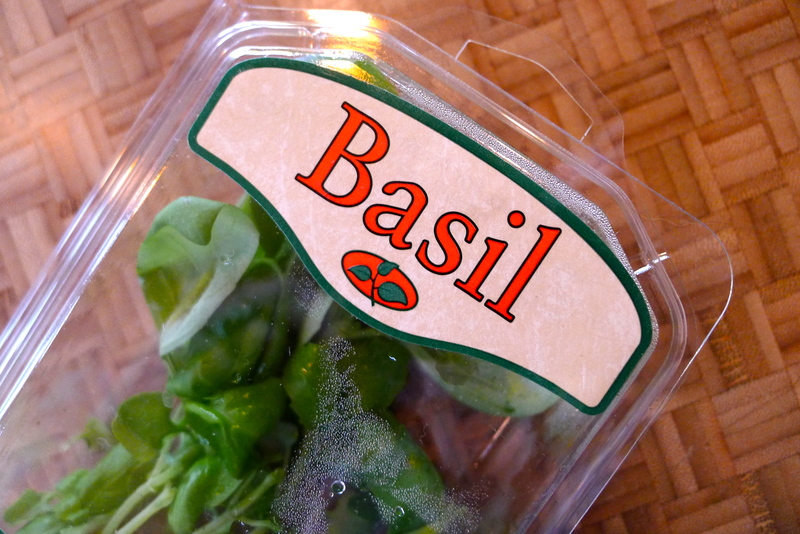 Meanwhile, combine ricotta, mozzarella, spinach, and most of the basil in a bowl (reserve some basil for garnish). 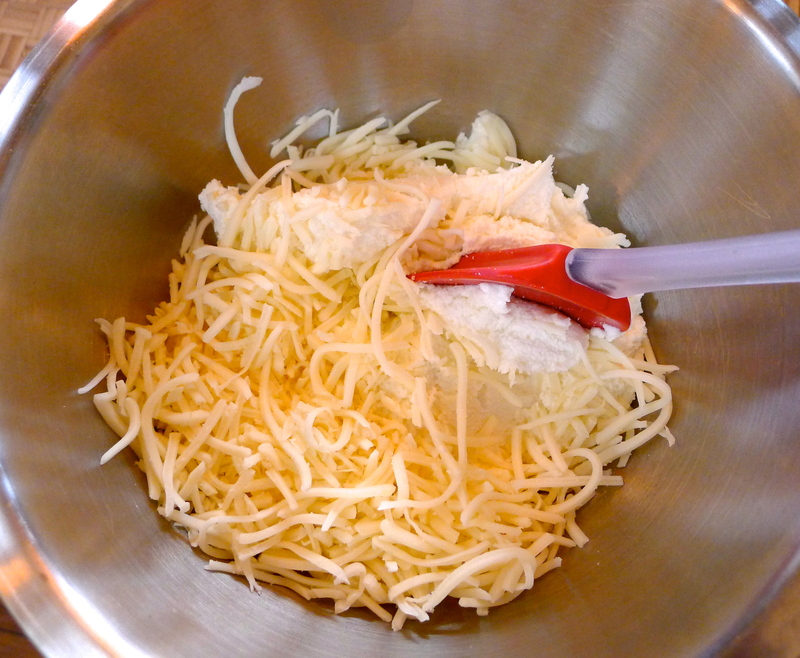 Add the same seasonings to the cheese mixture as you did to the meat, as well as cracked black pepper. Generously flour your counter. 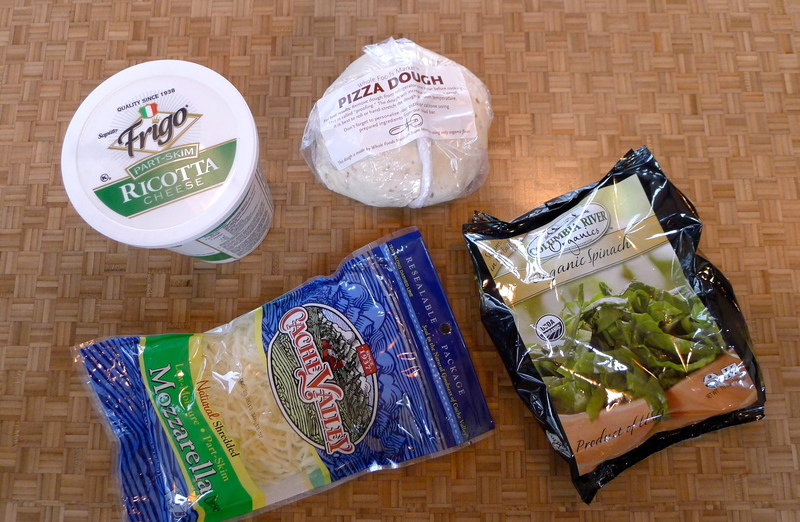 Divide the pizza dough into six chunks and roll out the dough into thin discs. 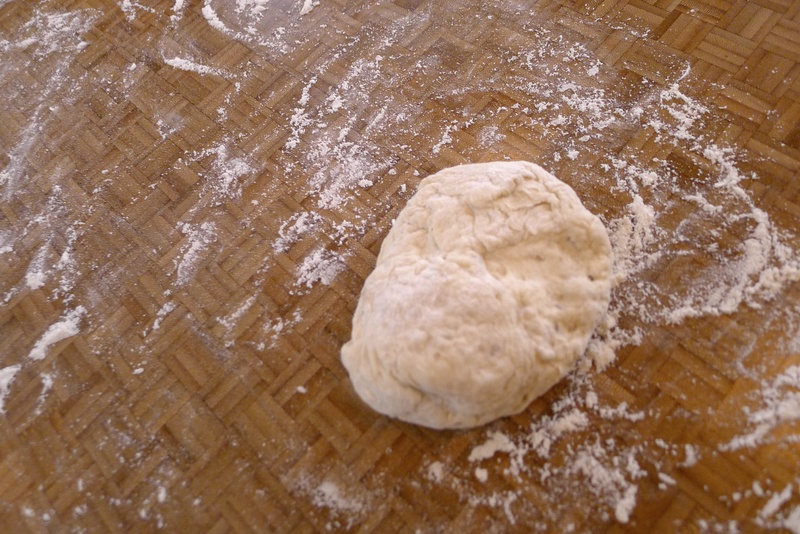 One at a time, transfer the dough disc to the baking pan. On one half of the dough, spoon first some of the meat and then some of the cheese (maybe 2 heaping spoonfuls of each), leaving a half-inch of dough space to the edge. 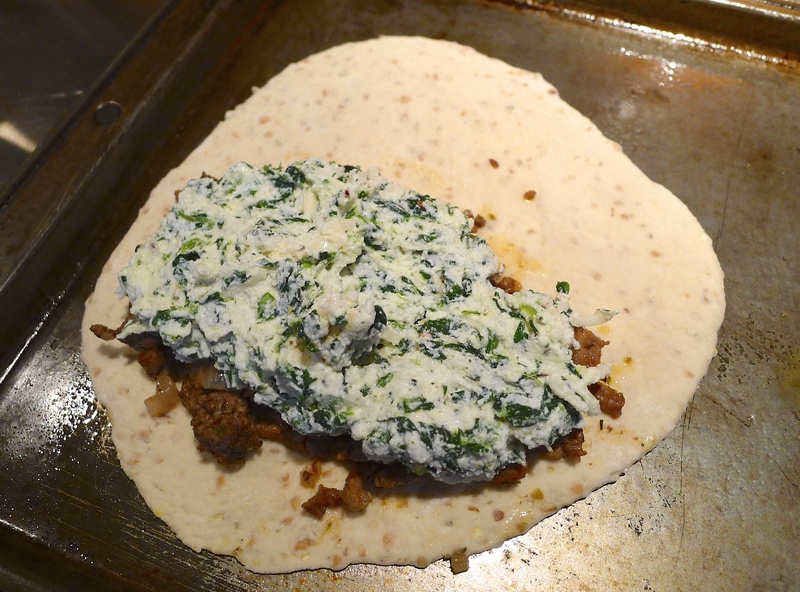 Fold the dough over the meat and cheese and securely crimp the edge so no filling can melt out in the oven. 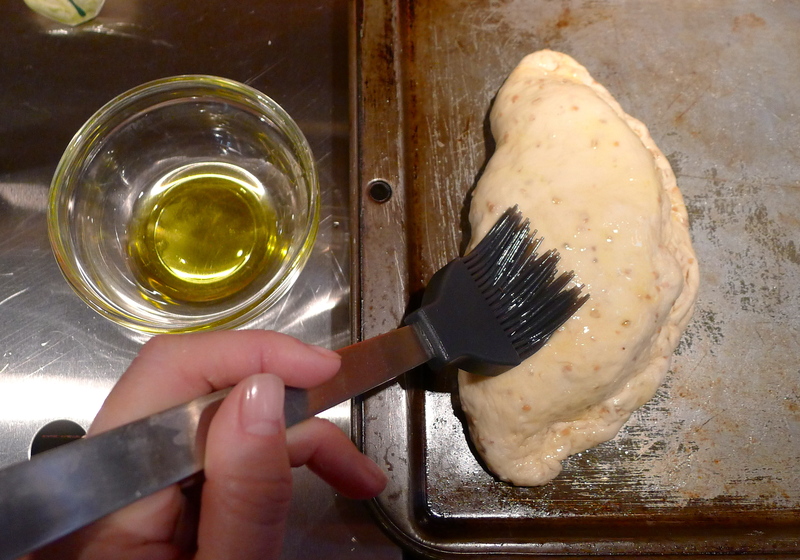 Brush the top of the calzone with olive oil. 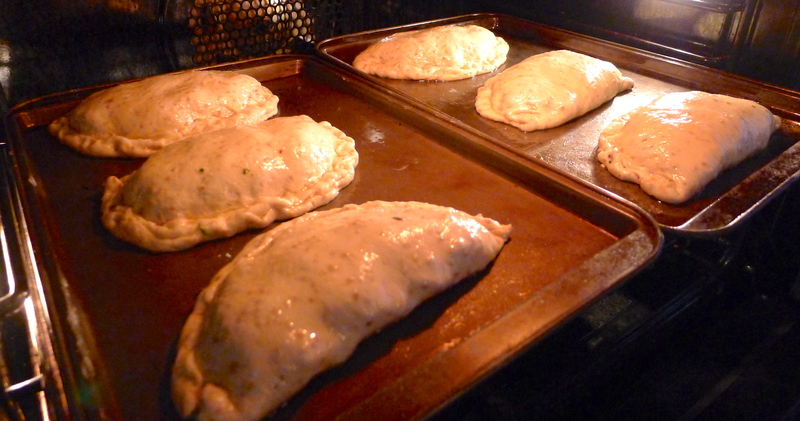 Repeat until you have six calzones on two baking pans. 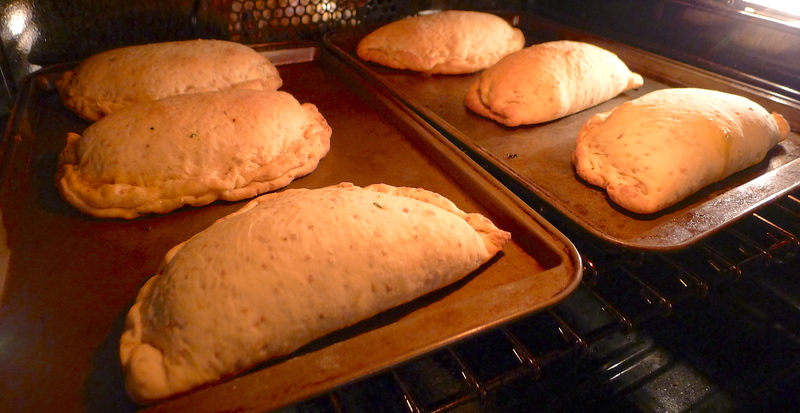 Bake for 20-30 minutes, or until the tops of the calzones are golden brown. While they bake, heat the marinara sauce on the stove. 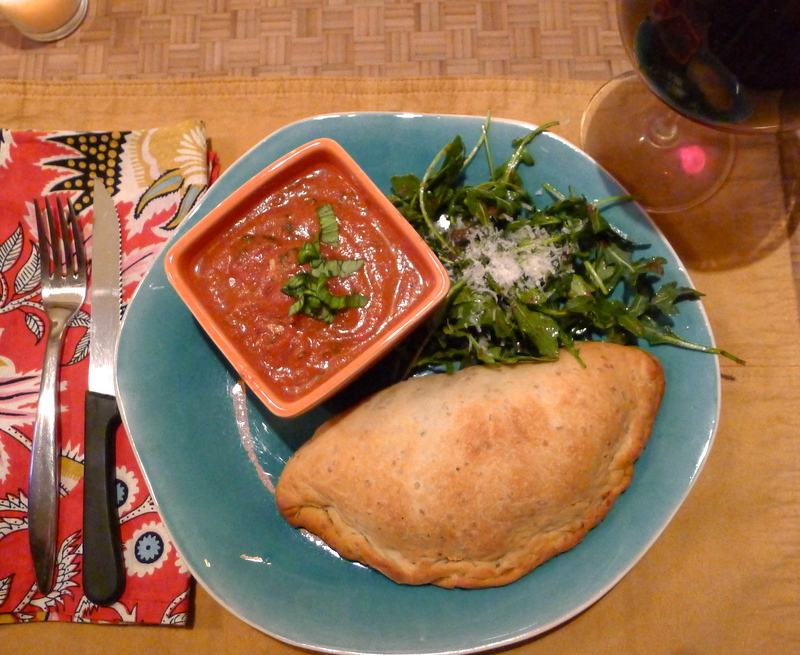 Serve the calzones with a cup of marinara on the side, sprinkled with fresh basil. Just shrug and smile when your husband tells you that you are, in fact, a domestic goddess. Salad optional. YUM! wow girl!!! great life to lead, very impressed the way you live! way to go!!! Thanks! I feel very lucky.